which returns 0.0 if the LogUserDefValue01 is blank and does the other calculation if there is a number present. Does anyone have any idea how this could be done? I am storing the Oxygen % as a decimal in LogUserDefValue01 and the above formula calculates the EAD. I have another formula query which I hope someone can help with. 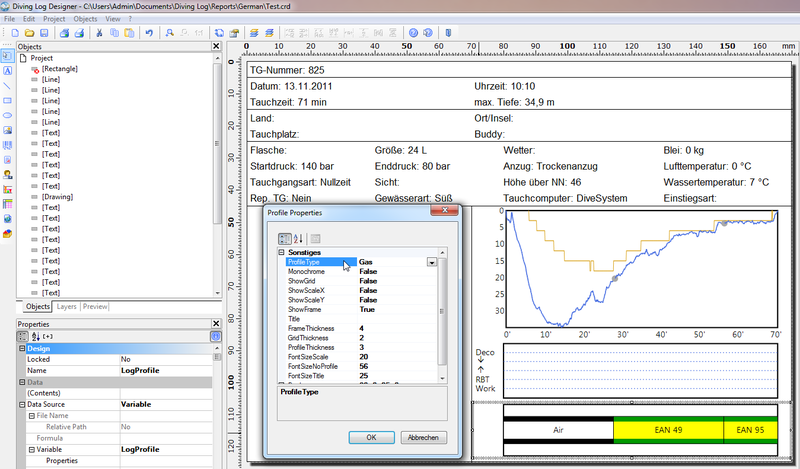 At the moment I have this formula 'Cond(LogTankSize=14,"ü")' which puts a tick in a box if the tank size is 14. I would like to put the tick in the box if the tanksize was either 7 or 14. Can this be done? I have tried to do a multiple if statement but it is not clear from the designer manual if this is supported. I want to have a formula that checks the entry in the dive type field for a specific type in order to populate a spefic dive type box with a tick. So for the 'Fun' box it would examine the field and look for a 1, for the Education box if would search the entry for a 2 and so on. Can you use a wildcard with Cond(LogDiveType ="Fun","ü")? I print my log pages in batches of 4 so I get 2 per side of a sheet of A4 using booklet printing feature on my printer. The problem with this is that the Bottom time to date calculation is the same on all the log pages in that batch. Is there any way to make the calculation work based on the individual dive numbers from a group of dives? Adeydiver wrote: I print my log pages in batches of 4 so I get 2 per side of a sheet of A4 using booklet printing feature on my printer. I'm new to the forum and DL5.0 so forgive me if I am using the forum inappropriately. The attached question is one I've been trying to figure out myself. At the top of the logbook print out it has Divenumber and time displayed. I would like to add 'total dive time' to this line, but only up to and including the current dive. Everything I've tried thus far shows total time for all dives in minutes. I'm not SQL versed, so if someone could identify the appropriate field and syntax for adding this item to my printed log page I will be grateful. Also I'd like the time displayed in HR:MIN rather than total minutes. Normally the formula you quoted should do the trick, have you tried that one? This is probably a step too far but I'll give it go. I use LogUserDefValue01 to store the amount of O2 in a nitrox gas and then have a calculated field in my log page to work out the O2 partial pressure ((LogDepth +10)/10) * val(Fstr$(((Val(LogUserDefValue01)/100)),"#####&.##")). 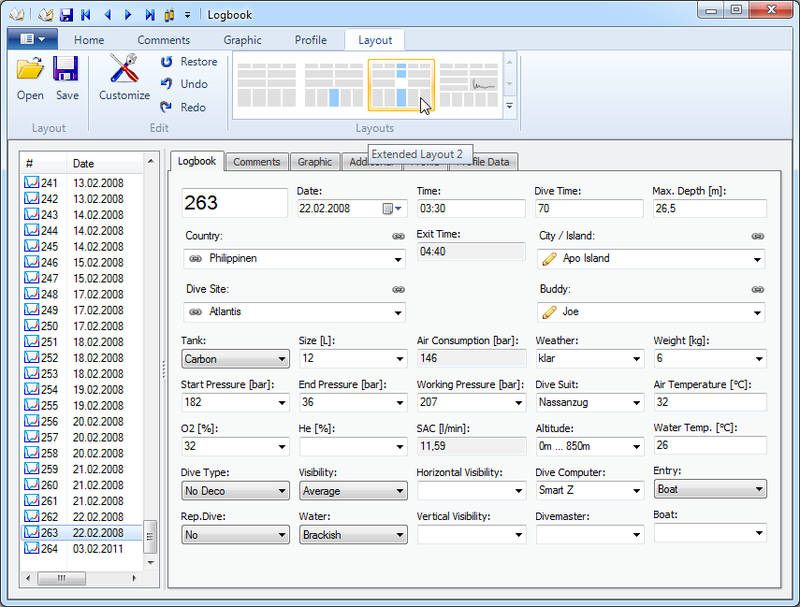 What I would like to be able to do is have a way to do a lookup to either a new table within the access database or even an external excel worksheet to find the oxygen exposure. In excel you would use something like Index and match functions. You would need to plot the LogDivetime on the x axis and the calculated O2 pp on the y axis and show the %value at the intersection of the appropriate column and row. Any thoughts if this would be possible? If you enter the O2 value into the O2 field this is all working as it should. Just use the extended layout 2 or add the O2 field to your own layout. 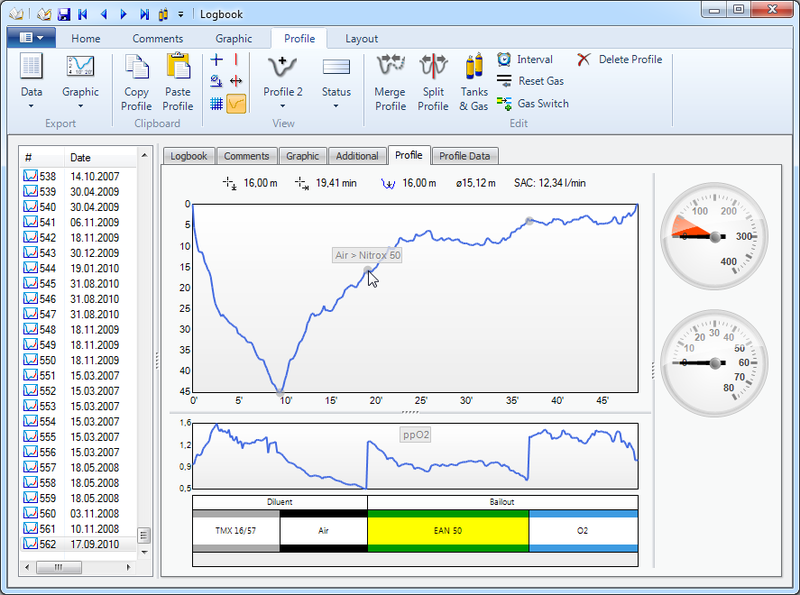 Then you can simply display the PPO2 profile.